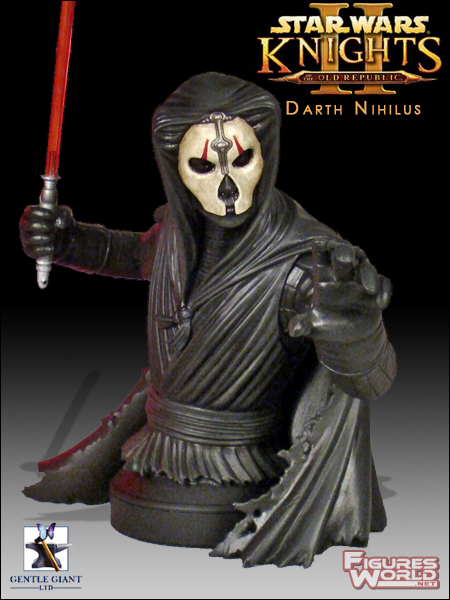 This menacing Darth Nihilus Exclusive Mini Bust by Gentle Giant Studios is the first ever resin collectible based on the fan-favourite Sith Lord from Knights of the Old Republic II. He survived the activation of the Mass Shadow Generator superweapon during the war's final battle at the planet Malachor V, which surrounded the planet with a destructive spacial phenomenon known as a mass shadow that obliterated almost everything and everyone on and around the planet. The experience of the shadows made him "hunger" for Force energy, and the affliction began to ravage his body. In his pain he became a wound in the Force and was found by a seeker of such things, the Sith Lord Darth Traya, who told him that she could teach him to feed his hunger. He accepted her offer, becoming Traya's apprentice at the Trayus Academy on Malachor V, and, over time, became one of three concurrent Dark Lords of the Sith.